In mainstream political journalism this election season, the white male reporter (still) reigns supreme, according to a series of studies by online media project 4th Estate. According to the organization's newly released report, "Bleached," the authors of 2012 election coverage are overwhelmingly white; a report published in May, "Silenced," found a similar lack of women reporters. 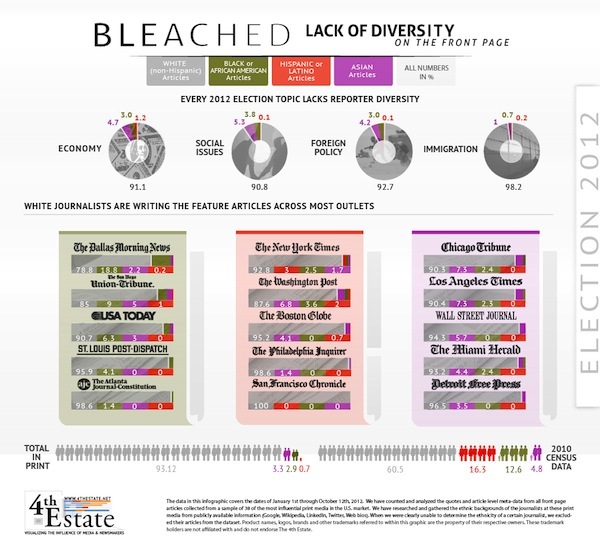 Though people of color make up over a third of the U.S. population, journalists of color wrote only 6.9 percent of all print features published in major U.S. newspapers in 2012, from The New York Times to the San Francisco Chronicle. Latinos account for a mere 0.7 percent of that number, though they are the largest minority group in the country. During this election year, reporters covering immigrant communities--a hot-button topic and a common scapegoat of the Right--are alarmingly white. Ninety-eight percent of front-page articles on immigration were written by white journalists, as opposed to 1 percent by Asian reporters and a mere 0.2 percent by Latinos. In short, fewer than 2 in every 100 immigration stories that made the nation's front pages were reported by a person from either of the nation's two largest immigrant communities. In excluding insiders, major media outlets lose out on the sensitivity that a reporter with a history or affiliation with Latino and Asian communities could offer. Perhaps a dearth of journalists of color on staff is a factor in the Associated Press' persistence in using the term "illegal immigrant"? Apparently, being white isn't enough to get work published this election cycle: Masculinity matters, too. 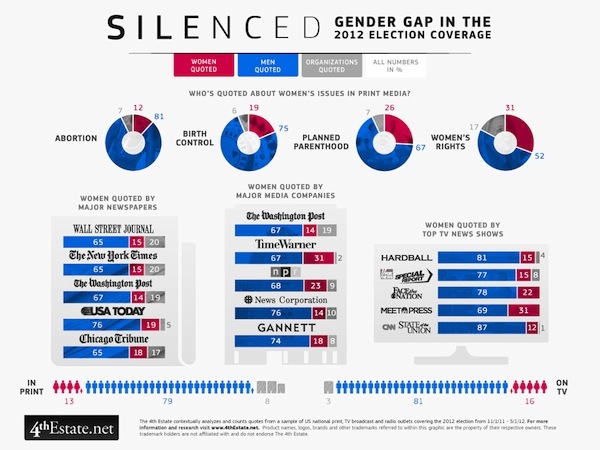 Only 1 in 4 news reporters covering the election is a woman. Similarly, the op-ed pages are even more lacking in women, only accounting for 20 percent of all op-ed pieces printed in big name papers like the Los Angeles Times. If you need proof, browse bylines of the Washington Post's op-ed section. Of that 20 percent, hard-news analysis from women is near impossible to come by, with fewer than 15 percent of stories on international politics and the economy written by women. Despite the ongoing "war on women," men write the majority of, and are more frequently quoted in, election pieces relating to women's or gender issues. Less than half of those quoted in print regarding women's issues were women, according to 4th Estate--and for stories related to abortion and birth control, less than a quarter. Of topics pertaining specifically to women, abortion coverage had the smallest proportion of quotes from women: just 12 percent. Infographics from the 4th Estate.